A well-designed cabinet can add ambient atmosphere to your room. Redesign a new beautiful one or just dream of it? To deliver perfect result, you can see your dreamy cabinet on screen before you build it. Isn't it wonderful? 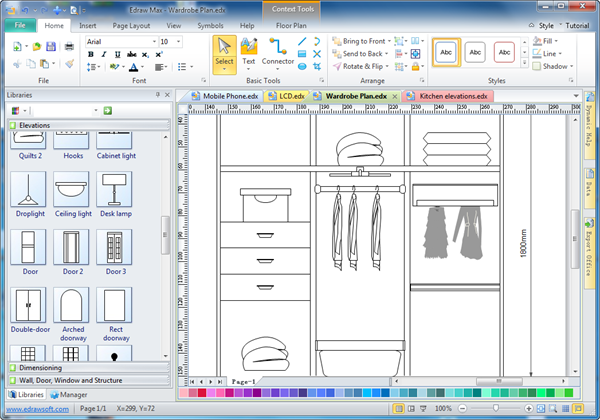 Edraw cabinet design software is one of the most capable, flexible and easy-to-use software package available. You can apply our program to design cabinets and furniture "from scratch". What makes it outstanding is that you have total control over everything by gaining an instant visualization, different views or elevations, calculations and reports. That is why our software is useful for individuals, small cabinet shop, as well as large manufacturers. 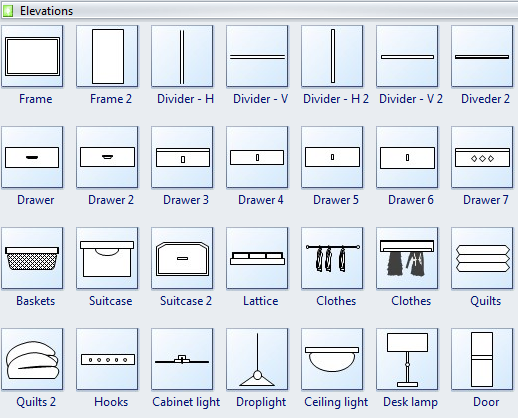 Discover why Edraw is the most superior software to design cabinets: Try it FREE. • Tool bars that contain some of the most useful commands, e.g. : move to, flip, align, rotate and distribute. To summarize, using this program is like creating real cabinets - the user operates on cabinets, arranging them in the virtual space as if they were real. You can create your own catalogs of elevations, cabinets and materials or take advantage of the catalogs included in the program. Cabinet designs can be done extremely quickly and easily with this one-stop-solution. The likelihood that budgets are not exceeded greatly increases. All of these features make up a powerful tool that dramatically increases efficiency, effect and enjoyment. The designer can use predefined elevation symbols, wall elevations and dimension symbols to represent cabinet plans easily.